10tons has provided us all with another fun game to fill up our precious Nintendo Switch memory cards. 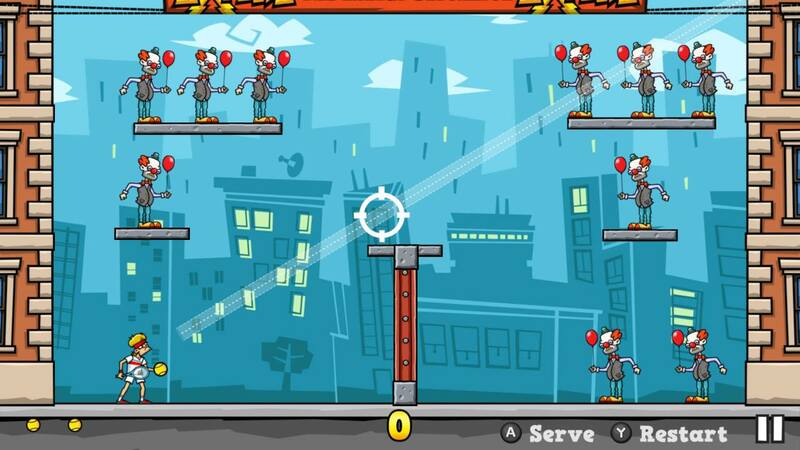 Tennis in the Face is a physics puzzle game that asks the question- what happens if I use my tennis skills to destroy clowns, police, and hipsters? A whole hell of a lot of hilarity, is what. World famous tennis legend Pete Pagassi is arrested after trying to break into sponsor Explodz energy drink's warehouse to get more of the good stuff. After this, he realizes that he has been driven by addiction, and vows to dismantle the evil corporation to get Explodz off the shelves. It's absurd, but fittingly so. I couldn't help but find myself laughing at the story bears delivered via newspaper headlines, and often found myself smiling at the slightest things during game play. 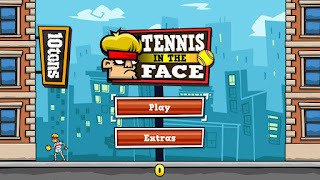 Like many physics-based puzzle games before it, Tennis in the Face relies on obstacles, platforms, and precarious arrangement of volatile items. There are glass barriers that can be destroyed, but also destroy your ball. There are cans of Explodz that do exactly what you expect they would when struck. 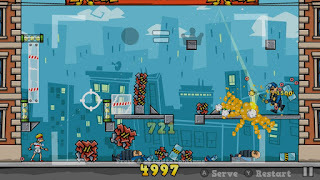 You will find tubes of tennis balls that can be unleashed on the stage by striking them. There are a variety of enemies, and some have their own unique features which makes them part of the puzzle, or just add to the game's already quirky charm. 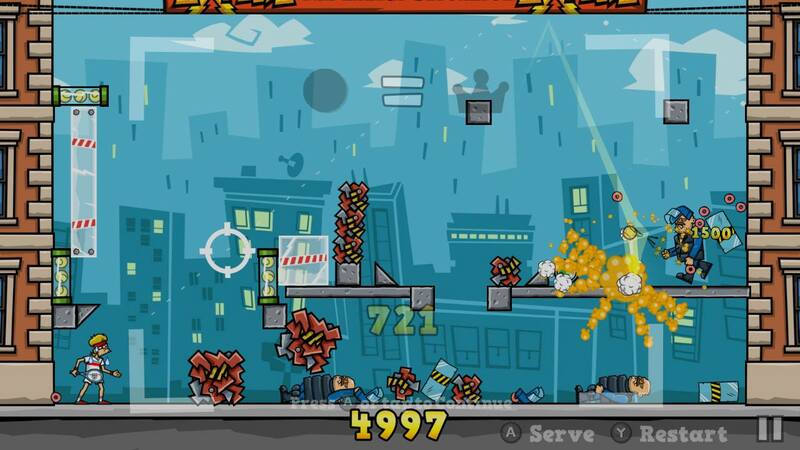 For example- cops have shields that protect them from one hit from the front, but also spread donuts out when hit. Tennis in the Face gives you the opportunity to take your frustrations out on more understandable targets- clowns, riot police, mad scientists, and hipsters. 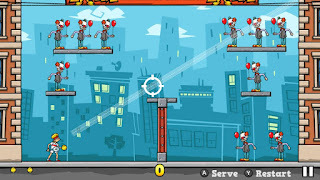 You bounce your tennis ball around the level to eliminate these stationary targets, and can take advantage of the environmental extras mentioned above. You will also get other items to use to work your way through each puzzle, and you get three shots to do it in. The only drawback I really saw to this, was that you didn't have the opportunity to change which of these items you brought into a level with you. This isn't unique to Tennis in the Face, and the first time through it is best to solve the puzzle in the manner intended, but I would like to be able to go back and replay levels using whichever items I wanted to. Overall, not a bad get for under $5. 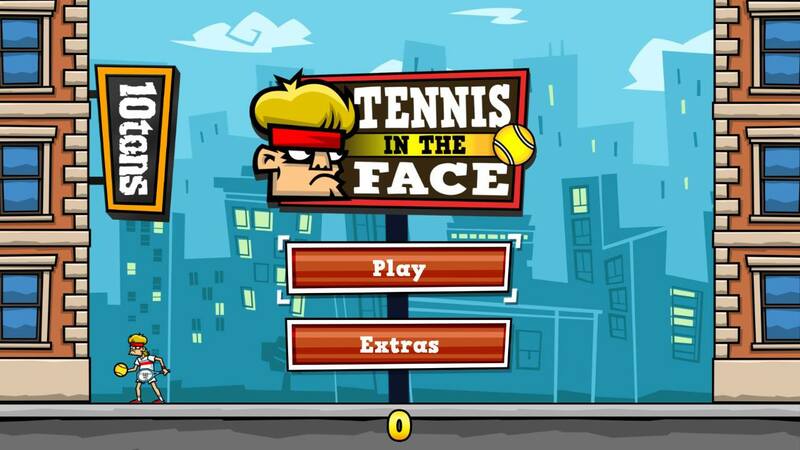 Tennis in the Face will be live in the eShop on Friday, December 8th in North America.